Have you ever found yourself in this situation: the Chief Muckety Muck at work purchased an expensive laser copier/printer/imaging machine for the office. It works great…for a while. But eventually things don’t work as well as they used to. 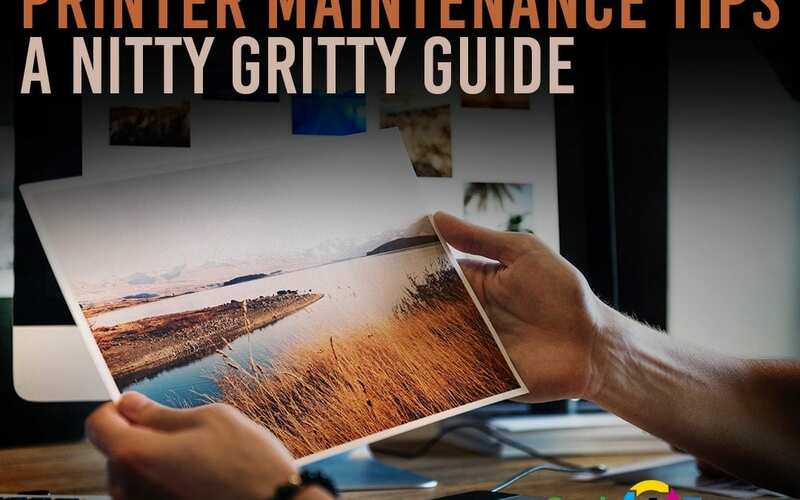 Chief Muckety Muck doesn’t care — he or she paid for a high quality printer, but they’re no longer getting high quality prints. It’s up to you to get that machine running as good as it once did. Welcome to Printer Maintenance 101. If you clean your printer regularly you’ll avoid major problems down the road. Laser printers get dirty with toner dust and paper remnants. Both the inside and outside of the printer can be wiped down with a damp or lint-free cloth. While cleaning your printer, never apply too much force even if you encounter stubborn grime. Use soft bristles and moistened Q-tips to remove the grime. Don’t use a normal vacuum cleaner or compressed air. This may damage printer components. Clean the rubber feeder rollers with isopropyl alcohol. This will clean them, yet maintain the rubbery grip they need to move pages along. Wash your hands with cold water and soap after the procedure is done. You don’t want toner dust on your skin. Blurring, Smears, and Streaks — These issues can be caused by a defective or improperly installed toner cartridge. Print several blank pages and see if this fixes the print quality. Try cleaning the internal components of the printer like the laser scanner/mirrors. If this does not fix the issue, re-install the toner cartridge. If unsuccessful, your toner cartridge may be defective and you should replace it to see if it fixes the problem. These issues can also be caused by a defective drum unit. If reinstalling/replacing the toner cartridge is unsuccessful, replace the drum unit next. Fading — When a toner cartridge is low on toner, fading will often occur. Replace the toner cartridge and your printouts should no longer have fading. If your printer is not low on toner and your printouts are still fading, it could be caused by a transfer roller issue or a laser mirror that needs to be cleaned. Blank Spots — Blank spots can be caused by a defective toner cartridge or a damaged transfer roller. If possible, inspect the inside of the printer to see if there are any visible obstructions. If there aren’t, replace the toner cartridge and see if that removes the blank spots. If it doesn’t, replace the transfer roller and see if that removes them. Color On Black-and-White Prints — If you see traces of color on your black and white printouts, then your color toner cartridges are likely leaking. Clean your printer and remove all leaked color toner. Replace the leaking color toner cartridge(s). Half-Page Printouts — This is a common toner-related issue, but can also be a drum unit issue. Unplug and restart both your printer and computer, and print out a page to see if the issue has been fixed. If not, an error message should explain the problem, identifying whether it is a toner or drum unit issue. If your printer is still printing half-page printouts and there is no error message, try replacing your toner cartridge. If you replace your toner cartridge and it isn’t fixed, try replacing your drum unit next. Outdated Printer Drivers — Keep up-to-date by installing the latest drivers from the manufacturer. Some printers also indicate when a new driver is available at the manufacturer’s website. Do not ignore such “new driver available” notifications. Many hardware malfunctions with printers have been traced back to outdated drivers. Check your manufacturer’s website regularly for updates. If printing problems persist, it may be time to order an OEM maintenance kit, which will help you clean the printer fan and other vulnerable parts that are prone to accumulating dust and residue. 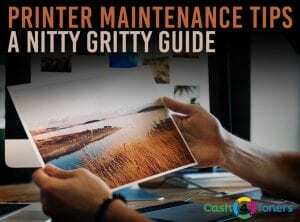 Check the printer’s page counter to see if it’s time to perform more intensive maintenance. An OEM maintenance kit for your laser printer will usually include a new fuser, transfer roller, and various feeder rollers, though the actual contents of the maintenance kit may vary from brand to brand. Installing an OEM maintenance kit isn’t difficult — all you’ll need is a pair of latex gloves, a standard, flathead screwdriver, and a bit of patience. We recently installed a maintenance kit on a 15-year-old HP Laserjet 4250. We replaced the following parts in the following order, but even if you don’t have an HP 4250, the method should be similar on other laser printers. Turn the printer off and unplug the power cord. If you used the printer recently, the fuser will be hot, so wait 30 minutes before performing any other tasks. Remove duplexer if you have one. Remove the output bin and the fuser. Open the rear output vent and then use a standard screwdriver to remove the vent, pushing on the hinge until the door pops off. Next, pinch the two levers on either side of the fuser until they release, and pull the fuser out. Push the new fuser into the back of the machine until the tabs click into place. Re-install the rear output vent door by working the pins back into the hinges. Remove packing strips from new cartridge and drum. Using the hooked end of the tool provided in the maintenance kit, (or the tip of your screwdriver) lift the left end of the transfer roller. Once it is out, slide it to the left and remove it. When installing the new transfer roller, do not touch the roller surface. Wear latex gloves and only handle the roller by the ends. Start by sliding the right end of the transfer roller into place and then work the left side gear down until it clicks into place. Remove the front accessory cover. Locate the pickup roller at the center of the tray. Release the roller by pressing the clips on each side of the roller simultaneously. Slide new roller into place until it clicks. Replace front accessory plate. Reinstall toner cartridge and close the cover. Locate the tray two pickup roller. Release the roller by pulling the tabs at either side of the roller, then slide the roller off the shaft. Slide the new roller onto the shaft and rotate the roller until it clicks into place. Install the tray two paper bin, leaving it half way out to allow access to the separation roller. Open the access door on the lower tray, exposing the roller. Remove the roller by pinching the two tabs at the end and pulling to the left. Install the new roller, turning until it locks into place. Plug your printer back in and turn it on. The main menu display on your printer should tell you new components have been installed and the printer may run some diagnostic testing to make sure they’re installed correctly. Once your maintenance is complete it’s a good idea to run a laser printer calibration to make sure all of your colors or true. Don’t forget to reset the page count back to zero once your maintenance is complete. Your printer manual is your friend, so keep it on an accessible nearby shelf. Eventually some mysterious maintenance light will pop on, and you’ll need the secret decoder ring inside your printer manual to figure it out. Lose your printer manual? Shame on you! You’ll have to search the web for a PDF replacement. Last but not the least, it is necessary to use your printer regularly. If your printer sits dormant for long stretches of time, the cartridges can dry up. It’s a good idea to print a page or two occasionally to keep your printer in good health.